Arrival in Helsinki, transfer to Hotel Scandic Simonkentta**** or similar, check-in, welcome meeting. The early morning is reserved for an optional guided shopping tour to fashion and souvenir boutiques on the Nevsky Prospect. Around noon we go to the Moscow Railway Station and board the Sapsan high-speed train bound for Moscow. The train ride takes us through endless Russian landscapes along the River Volga. In the late afternoon we arrive to Moscow and check in at Hotel HoliDAY - Inn Lesnaya**** or similar. Moscow, The Mother of Russia, is a genuine Russian city with the Kremlin and its onion domed cathedrals. The dramatic changes over the last decade have made the city to one of the most dynamic metropolis in the world. The morning sightseeing tour includes all the highlights of the vast city: the Red Square with Kremlin, the Theatre Square with Bolshoi Theatre, Sparrow Hills with Moscow University and a visit to the famous Moscow Metro. In the afternoon is offered an optional excursion to the Kremlin grounds with a visit to one of the cathedrals. 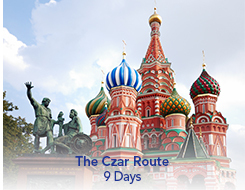 The evening offers an optional Moscow by night tour including an unforgettable river cruise with the White Flotilla. The morning offers an optional excursion to Novodevichy Convent, a 16th century cluster of sparkling domes, one of the city's most beautiful groups of buildings and full of history and treasures. The adjacent Novodevichy Cemetery is Moscow's most prestigious resting place after the Kremlin. The balance of the DAY - is reserved for an optional excursion to the Tretyakov Gallery with its outstanding collection of French impressionists. The evening offers an optional visit to the Old Russian Circus.